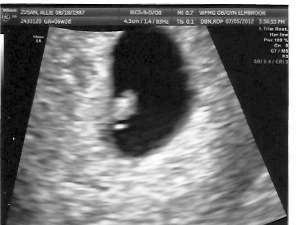 Yesterday we got our first look at Junior (as Grandpa Zusan has named the little bambino). Our doctor was wonderful enough to set up a ultrasound to calm my nerves about the whole process. At six weeks you can’t see much, but there is definitely a 4.3cm baby growing in there. Grammy (as my mom now calls herself) and Ben came along. It was definitely quite the experience to see our little one and the heart beating away. Now we are definitely convinced we’re going to be parents and can’t wait for what is yet to come. Though at this point, I just can’t wait to be done feeling nauseous.